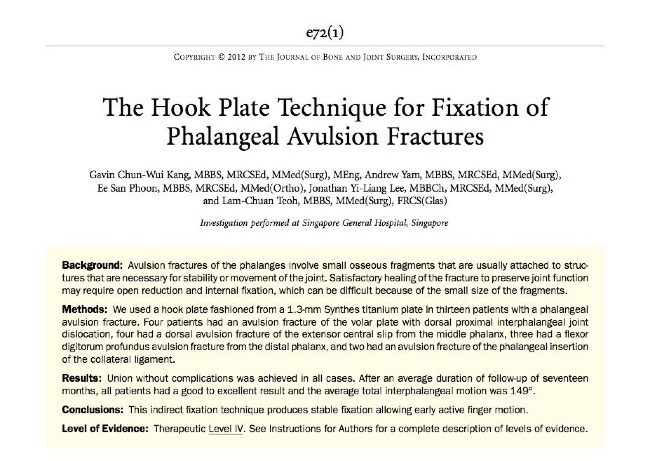 Dr. Jonathan Y. Lee and colleagues published a paper on a novel method for the treatment of difficult phalangeal (finger bones) avulsion fractures, in the prestigious Journal of Bone and Joint Surgery (American edition). Avulsion fractures are small fragments that are notoriously difficult to secure with earlier methods of treatment yet are critically important, as they are the attachments of important ligaments and tendons, and thus have significant functional compromise if they do not heal properly. The novel method modifies existing Synthes® titanium implants, to create a ‘hook’ plate that overcomes the shortcomings of earlier methods of treatment for these small, difficult to fix, but functionally significant fractures of the finger bones.